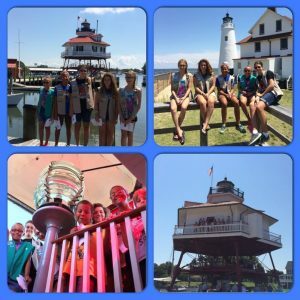 Scouts Earn Chesapeake Chapter Scout Patch – Chesapeake Chapter U.S.L.H.S. This quarter we received two applications for the Chesapeake Chapter Scout Patch! The following scouts received their patch, a certificate, and a copy of the Chapter’s Summer 2016 newsletter. 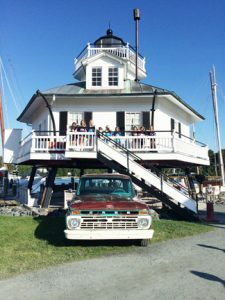 Girl Scout troop 1204, led by Christie Bennett-Zellers, from Bernville, Pennsylvania spent the night at Hooper Strait in June. The nine Scouts receiving their patch are: Juniors Sophia Zellers, Katelyn Hussman, Syvilla Hillbish, Jessica Maurer, Avery Baransky, Hannah Winchester, Hannah Wilson, Kyleigh Thorsen, and Kira Thorsen. Four Scout Troops from Indian Head, Maryland – Led by Elaine Morgan, completed all the activities to earn the patch. 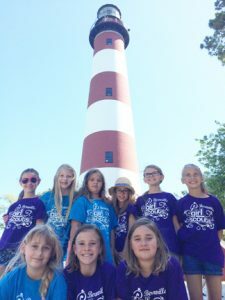 For their service project they made posters to share at their local library and visited Cove Point and Drum Point; they also learned about Ft. Washington and Jones Point lighthouses. Girl Scout Troop 2492: Seniors Emma Morgan and Lydia Williams; Cadettes Elizabeth Jones, and Jilliann Downey. 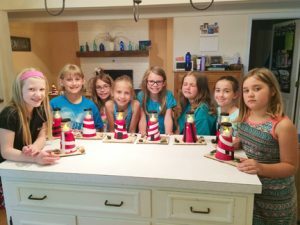 Girl Scout Troop 6461: Senior Kelsey Swegle. Girl Scout Troop 2505: Juniors Amanda Williams and Gaby Alcantara. Cub Scout Pack 425: Webelos 1 Mark Morgan, Benjamin Jones, and Brandon Williams.